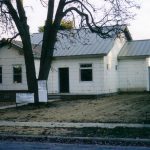 We broke ground on The House on Third Street ten years ago. I was ten years younger and I had whole lot more gumption and ambition than I do today. But on the other hand – building and living in our home has taught me a lot. Yes it took a lot of hard work – and it was an investment in a neighborhood that probably won’t provide a financial return. But, we love living in this house – and each and everyday we feel privileged to share and enjoy the comforts it affords.